If you're an engineer or scientist who has suddenly been thrust into the world of management, you may find yourself thinking that managing people is more of a challenge than your former highly technical job. Veteran management consultant Michael K. Badawy couldn't agree more. He says, "The primary problems of engineering and R&D management are not technical--they are human." 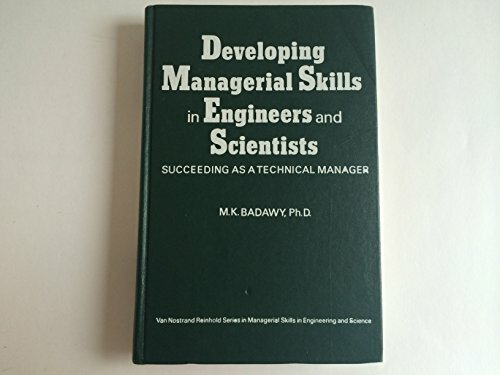 Badawy offers real help for the human side of technical management in his classic Developing Managerial Skills in Engineers and Scientists. Since 1982, thousands of technical executives, supervisors, managers, and students have turned to this classic for hands-on management techniques. This thoroughly revised second edition hones in on issues facing today's technical manager: Total Quality Management Technological entrepreneurship Cross-functional teams Success requirement for project management Interdepartmental interfacing Educating technologists in managing technology As a 21st century technical manager, you hold the reins to a corporation's most powerful resource--technology, the key to profitability and growth in an increasingly technological era. Using the tools in this practical management reference, you can become the kind of manager whom corporations will be battling for: an excellent manager who understands people, administrations, and technology. You'll learn how to organize, coordinate, and allocate resources while setting goals and troubleshooting. Instructive case studies of both successful and struggling technical managers clearly illustrate management do's and don'ts. You'll also find immediately applicable techniques and tips for managerial success. Badawy focuses on the technical manager in action with concrete approaches that always address the specific needs of the manager. Among the topics covered are preventing managerial failure; practical mechanisms that strengthen technologists' management skills; issues in career planning and development, decision making and evaluation of engineering and R&D efforts; and strategic thinking and planning skills. Badawy's down-to-earth language and practical examples bridge the gap between theory and practice, making it a snap for both the novice and the initiated to translate theory into everyday solutions. Plus, you'll find career guidance as well as up-to-the-minute coverage of current managerial training programs. 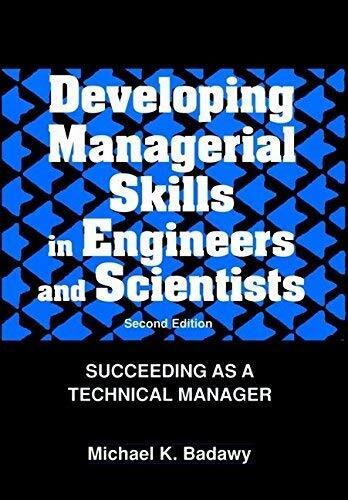 A bounty of tables, charts, and diagrams further enhance Developing Managerial Skills in Engineers and Scientists, making this volume indispensable to all those technical professionals interested in becoming 21st century managers. As a 21st century technical manager, you hold the reins to a corporation's most powerful resource--technology, the key to profitability and growth in an increasingly technological era. Using the tools in this practical management reference, you can become the kind of manager whom corporations will be battling for: an excellent manager who understands people, administrations, and technology. You'll learn how to organize, coordinate, and allocate resources while setting goals and troubleshooting. Instructive case studies of both successful and struggling technical managers clearly illustrate management do's and don'ts. You'll also findimmediately applicable techniques and tips for managerial success. Badawy focuses on the technical manager in action with concrete approaches that always address the specific needs of the manager. Among the topics covered are preventing managerial failure; practical mechanisms that strengthen technologists' management skills; issues in career planning and development, decision making and evaluation of engineering and R&D efforts; and strategic thinking and planning skills. Badawy's down-to-earth language and practical examples bridge the gap between theory and practice, making it a snap for both the novice and the initiated to translate theory into everyday solutions. Plus, you'll find career guidance as well as up-to-the-minute coverage of current managerial training programs. 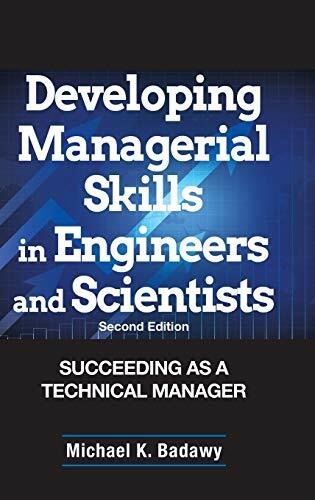 A bounty of tables, charts, and diagrams further enhance Developing Managerial Skills in Engineers and Scientists, making this volume indispensable to all those technical professionals interested in becoming 21st century managers.